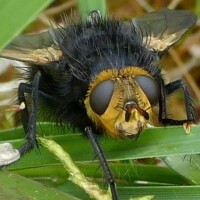 The Giant Tachinid Fly resembles a bumble bee in flight. It is found in woods and on heathland from February until September and is a parasite of large caterpillars. This individual was found at Duror, on Thursday 5th July 2012. Photo taken by Carl Farmer What an ugly brute, no not Carl ! !